Insomnia is a sleep disorder which can affect your healthy living. It can result in lack of both quality and quantity of sleep that can affect your health, mental prowess, lifestyle, and even relationships. In addition, it may also cause daytime sleepiness, fatigue in the morning and may lead to chronic sleep disorder affecting one's health and performance in the long run. Your sleep schedule, bedtime habits, and day-to-day lifestyle choices make an enormous difference in the quality of your nightly rest. The following sleep tips will help you optimize your nightly rest, minimize insomnia, and lay the foundation for all-day energy and performance. Regularize your sleeping habit. Your body is more prone to following a certain pattern if you set a regular rhythm. Try to establish a certain time for sleep and then go to bed on the same time each night. Set your alarm on the same time every day, regardless of whether it's a weekday, a weekend or a holiday. Once your body recognizes a given pattern, it will follow your initiative and give in. Keep away from stimulants. Coffee is great for breakfast but it's a bad idea to drink a cup a few hours before you go to sleep. Coffee and other stimulants like tea and chocolates can keep your body feeling active and wide awake. So, take warm milk instead! Stay away from big meals at night. Try to finish your dinner within 2 hours of bed time. It is best to avoid on heavy, rich and spicy foods for the dinner, as it may take time to digest and may keep you up. Exercise regularly. Exercise helps to stimulate the body. Studies have shown that more physically active a person is, the more readily they fall asleep. So, if you sit at your computer all day long or lead a sedentary lifestyle, make a point to incorporate exercise or any physical activity to help solve your insomnia. Cut down on Alcohol and other liquids in the evening. Drinking lots of water, juice, tea, or other fluids may result in frequent bathroom trips throughout the night. Caffeinated drinks, which act as diuretics can make things worse. Quit smoking. Smoking can cause sleep troubles in numerous ways. Nicotine is a stimulant, which disrupts sleep. Make your Bedroom sleep friendly. The quality of your bedroom environment makes a huge difference in how well you sleep. Try to keep the noise down, keep your room dark and cool, and ensure that your bedding is always comfortable. 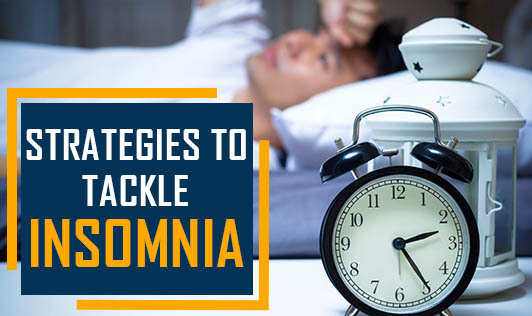 If the above tips don't help to solve your insomnia, then you need to consult a physician/ sleep doctor to find out the cause that could be interfering with your normal sleep. Do not rely on over the counter medicines and do not lose sleep over physical pain!